Pride (izzat) is very important in Punjabi culture. Family and its feared opposite, shame, play a great part in social behavior. A family that has to call in social workers to help with a domestic crisis, a teenager running away from home, for example, will lose face in the community. Asian families are supposed to be capable of sorting out their difficulties without recourse to outside agencies. Sikhs as has been said, encapsulate all the stages of life in one, but when parents become grandparents they are likely to modify their behavior and change their lifestyles. They will, of course, enjoy the company of their grandchildren and spend hours watching television, especially Indian films, but those who are devout will spend more time in the room of their house set aside for the Guru Granth Sahib, ‘Babaji’s room’ as they call it, if there is one. If not,they may stay in their bedroom for long periods reading their gutkas,books containing selected hymns, and meditating. The gurudwara becomes place which they visit daily for many hours. There they can mediate and meet old people like themselves and reminisce about life in Punjab.Sikhs wear turban which is famous in all over the world. The size of the turban depends on the person looks. The kurta, a long straight-cut, with pajamas, the loose baggy salwar makes up the traditional dress for Punjabis. In winter Punjabis wear Sweater, made by their loving mothers. The traditional Punjabi shoes called Punjabi juttis retain their popularity with both rural and turban men. 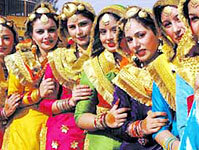 Patiala and Muktsar are famous for Punjabi juttis.Punjabi women wears salwar with kameez. Kameez is long straight-cut (like Kurtas) and above all with Duppatta. This dress is now famous among all the women’s nowdays. In winters they wear sweaters and shawls made by themselves. Punjabi women’s are also famous for their handicraft work. One particular example of the precise meaning of kinship names might be given to demonstrate what has been described above. Children learn these names from an early age and acquire the behavior proper to the relationship. ‘Ji’ is often added when more respect is being conveyed,for example, ‘taiji’. 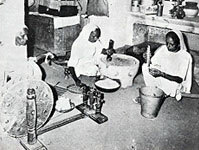 In traditional homes it is still customary for the men to sit down and fed by the women, who will only eat when the men have finished their meals, especially if there are guests to be entertained. Daughters will serve the food the other women have cooked. Having said this, it must be added that there are households, not only Sikhs where the family sits down at table together and its male members take a hand in preparing the meal and clearing the dishes afterwards.